Is Israel Preparing Another War on Hezbollah? Israeli media is awash with reports and analyses on an upcoming war on Iran-backed Shiaa militia Hezbollah. Buoyed by inroads in the Syrian war, Hezbollah has bolstered its regional foothold, raising fears in Israel that it may have acquired and smuggled game changing weapons into its Lebanese strongholds, and prompting Israel to carry strikes inside Syria against the Lebanese militia. The drums of war are beating again 12 years after Israel and Lebanon were left gutted by a war in which Israel achieved tactical victory, destroying Lebanese infrastructure and instilling fear in civilians, but failed to attain the strategic goal of defeating Hezbollah. In the wake of Hezbollah’s and Syrian regime’s victory against their opponents, the Jerusalem post paints a dim picture of an upcoming Israeli-Lebanese war based on five factors. The first factor is Iran’s bolstered presence through its ally Hezbollah in Lebanon where it plans to set up a weapons factory, a red line for Israel. “Israeli officials reject a permanent Iranian presence on their border — a message that Netanyahu delivered to Russian President Vladimir Putin when they met last month in Moscow,” the paper said. The US disengagement from the region and the increasing Russian role as a kingmaker in Syria is playing into the advantage of Israel’s foes: Hezbollah and Iran, said the paper, hence the rising voices for Israeli army to act preemptively to prevent Hezbollah from gaining strength. The fence Israel is building on its borders in Lebanon has been denounced by Beirut as an infringement of territorial sovereignty. The paper deems this an issue that adds fuel to the fire in the Lebanese-Israeli relations. Both the Lebanese government and Hezbollah have threatened a reaction to the unilateral border demarcation through the Israeli fence using a war rhetoric. Lebanon and Israel are also at odds over oil and gas offshore exploration licenses, the paper notes, recalling that Lebanon last month approved a joint bid by Italian, French and Russian oil companies to explore seas off its coast, an area also claimed by Israel. 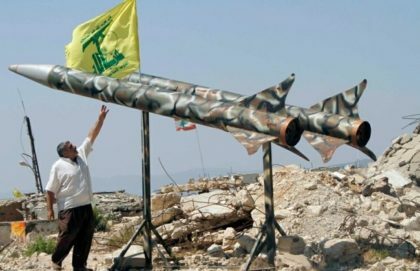 The paper claims that Hezbollah might find an opportunity to strike Israel in the North as it seems distracted with a war against Hamas in the South. Whatever the outcome of the war on paper, Haaretz on the other hand deems that Israel and Lebanon “ maintain a balance of terror, as seen during the Second Lebanon War”.